Disaster struck the Italian cruise ship Costa Concordia on Jan. 13 when the ship struck a reef off the Italian coast and ran aground at isola del giglio, Tuscany, causing an evacuation for the 4,197 passengers on board. The estimated death toll so far is 16 people including many injuries. Though some are calling this a tragic accident, others say it was a horrible, yet preventable, mistake made by Captain Francesco Schettino. The captain and First Officer Ciro Ambrosio were arrested after the accident on preliminary charges of multiple manslaughter, failure to assist passengers in need and abandonment of ship. On the night of the accident, Schettino claimed that the ship had struck an uncharted rock on the course. However, the reef that the ship collided with was charted in an area of the ocean known as Le Scole. Schettino later admitted that he had not been using the ship’s navigation system although he should have been. “I was navigating by sight, because I knew those sea beds well. I had done the move three, four times,” Schettino said. The passengers in the dining hall heard a sudden loud bang, which was said to be an electrical failure. “We told the guests everything was [okay] and under control and we tried to stop them panicking,” a cabin steward recalled. The ship lost electrical power shortly after the collision. Several minutes after the impact, the captain was then warned that the breach was irreparable- the tear was 70 meters (230 ft). “The boat started shaking. The noise – there was panic, like in a film, dishes crashing to the floor, people running, people falling down the stairs,” said a survivor. The passengers then felt the ship suddenly tilt to the side, and were then advised to put on their life jackets. A few minutes earlier, Schettino had decided to try and turn the ship south in an attempt to get closer to the harbor. However, the turn displaced the balance of the ship, and water began to flood the hull, forcing the ship to begin to sink into the water at 20 degrees on the starboard side. The tilt of the ship then made it difficult for crewmembers to launce the lifeboats. Gianni Onorato, the president of Costa Cruises, said the normal lifeboat evacuations were made “almost impossible” because the ship had begun to sink so quickly. 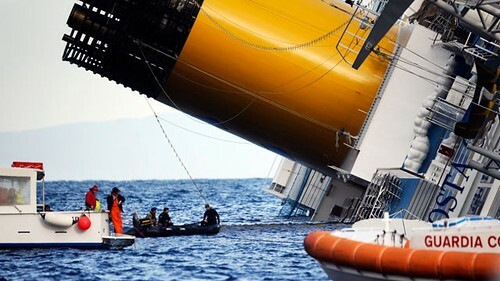 Many crewmembers and passengers say that the evacuation effort was hampered by miscommunication, caused primarily by Schettino. On one recording between Italian port officials and the Costa Concordia, an officer on the ship insisted that the ship was only suffering from an electrical black-out. However, that recording was made at 22:12 that night- 30 minutes after the collision. A video taken by a passenger showed the panicking passengers in life jackets being told that “everything was under control” and they should go back to their rooms and go to sleep. It was also showed that a patrol boat that saw the ship attempted to call the captain to make sure everything was okay. The captain had ordered dinner, and the call went unanswered. In fact, authorities had no idea the ship was in trouble until nearly an hour and a half after the ship made impact, and passengers were not told to begin evacuation until nearly two hours after impact. Many passengers and crewmembers agreed that if the order had been given immediately, then there would not have been a loss of life. Because of the careless evacuation, many passengers were injured, and more than a dozen bodies have been found. There are many rumors going around that there are still passengers trapped below the deck, and as of now many passengers are missing. This theory has been supported by the recent rescue of a crewmember and two passengers from the submerged deck. The recent discovery of a young woman’s body, whose name had not been listed on the roster, confirmed what authorities feared- there were several passengers that were not accounted for in the registers. Many snuck onto the ship, and there is no telling how many are still trapped inside the boat. Investigation into the wreck and the carelessness of the captain’s actions is still ongoing, and nothing has been officially confirmed just yet. But crewmembers, passengers, and witness alike agree that many bad decisions were made, and because of these mistakes, many lives were lost.